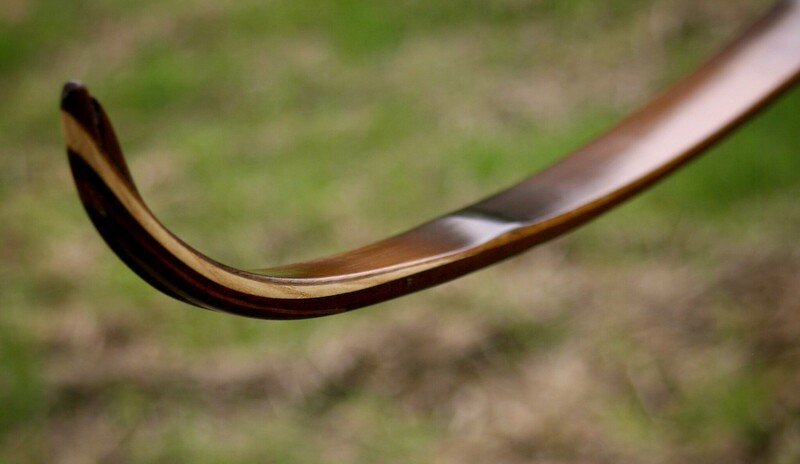 Lately I am on a self bow kick but I have always wanted to try a static laminated recurve. So in-between some self bows I started this one. 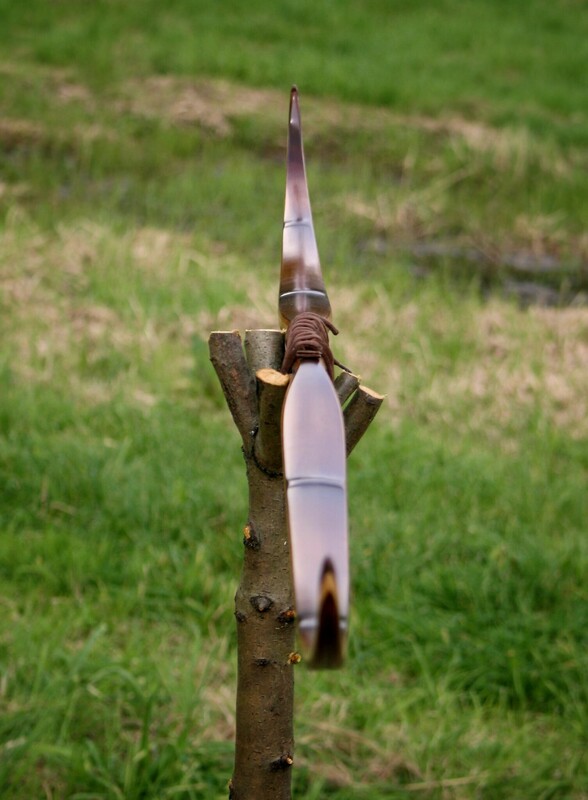 My lam bows are almost always backed with bamboo and for the belly I use either massuranduba or ipe. Since I only have access to hand tools (Except for a cheap belt sander) I decided on only two lams for this one to make sure I had enough belly wood to shape when tillering. 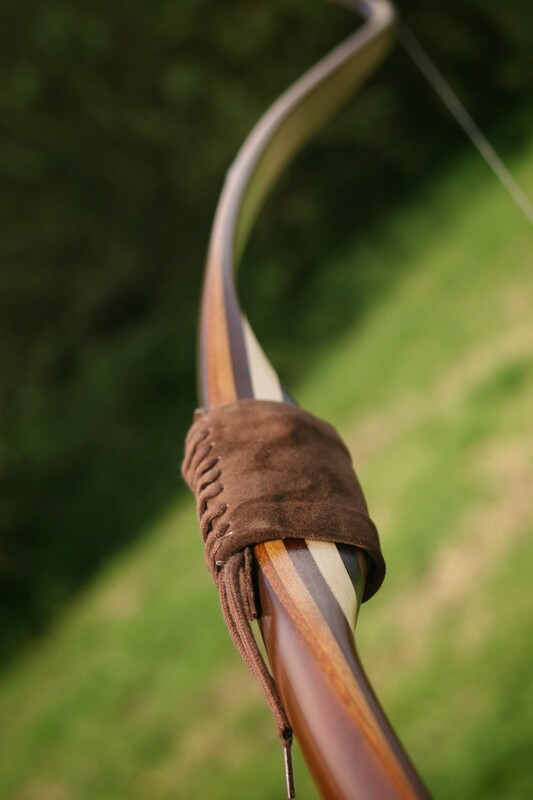 I know there are lot of guys who make laminated bows with extreme precision which come out of the form and are ready to string up. This is not how I do it. 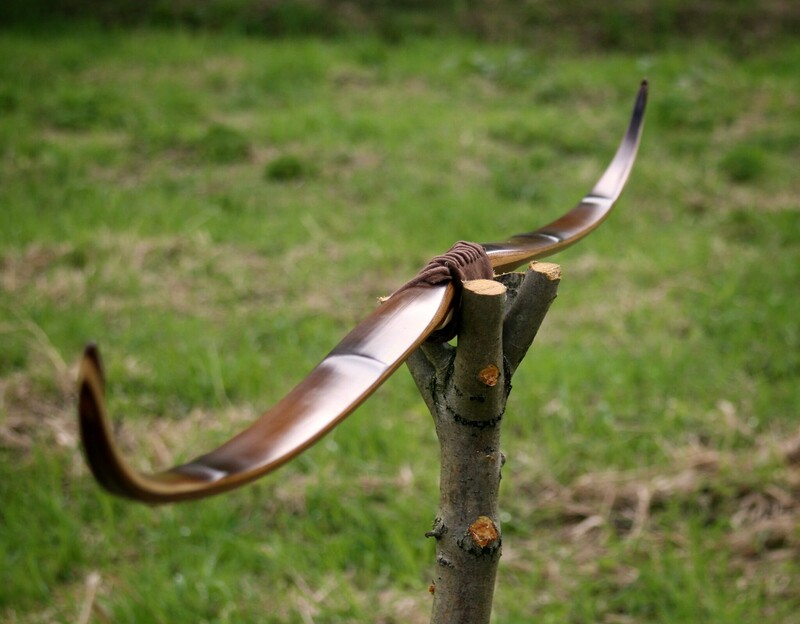 Basically I laminate the rough form into a bow stave and from that work on it as I would with a self bow. The obvious advantage is of course that you can easily add reflex and deflex shapes at glue up. Now gluing in a static recurve is a little different since you can’t bend ipe with heat and you can’t bend a thick piece over a tight radiused form without breaking it. So after some googling around for info I stumbled upon an old thread by Justin Snyder. 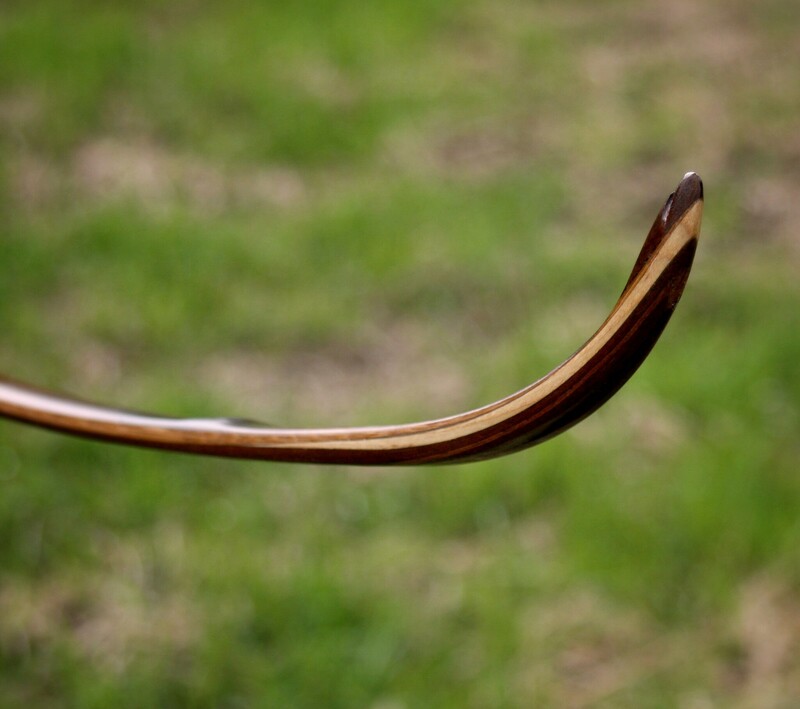 He used kerf cuts to bend recurves in ipe. 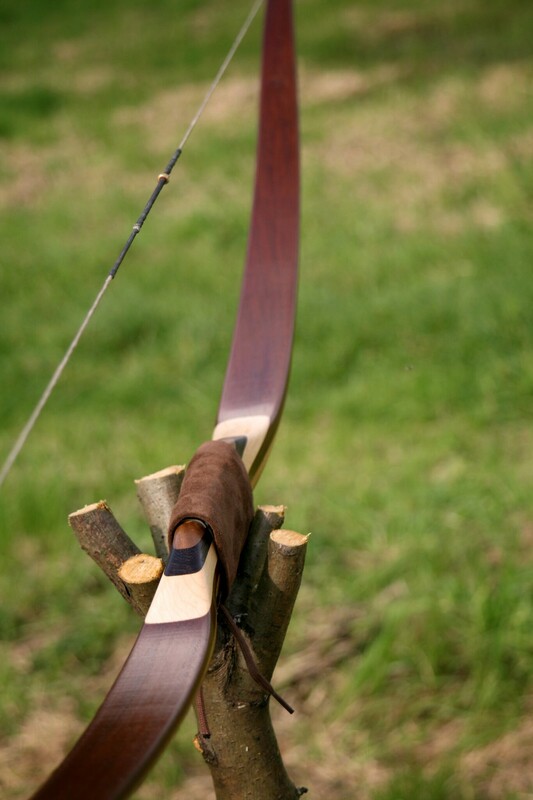 This basically works by cutting your tips in half and thereby creating two thin lams which are still attached to your bow;-) So I got the handsaw out and cut my lams in half, then stuffed some very thin ebony I had laying around in between with some glue and clamp it on the form. 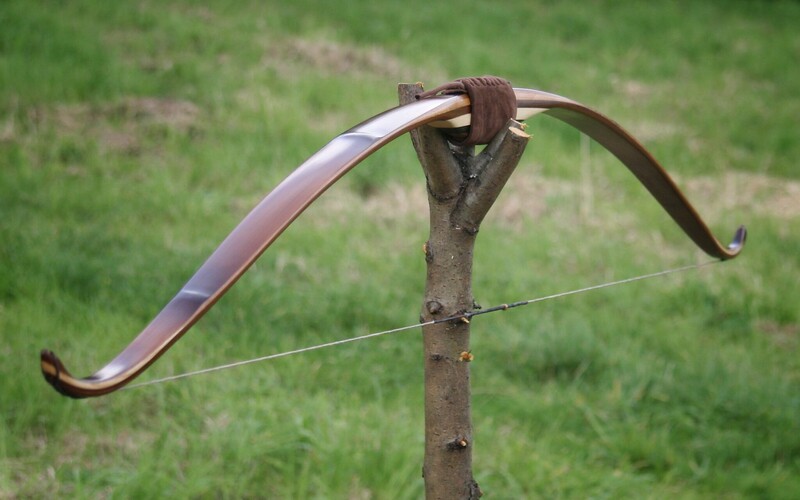 By far the easiest recurves I have ever made! After drying they looked great but where still a little thin so I added a piece of ash to stiffen up the recurves a bit. Rasped the transition from the ash with the belly smooth after drying and then glued up the bamboo and the powerlam. The reflex/deflex was glued in by using a few different height blocks and clamps. 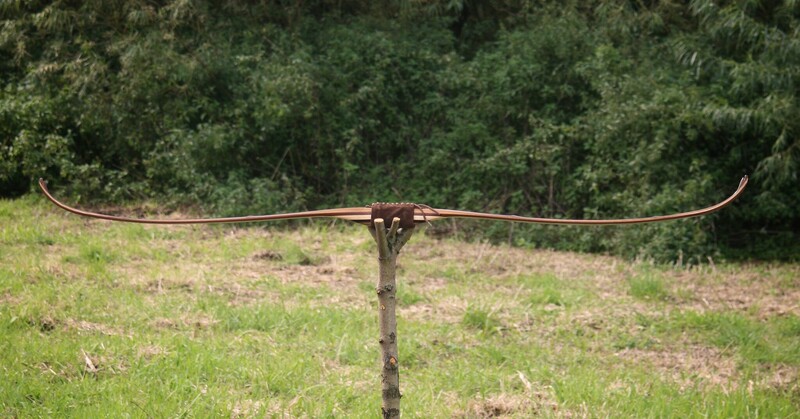 After that I added some leftover contrasting woods as a handle and started tillering as normal. The only problem I had was that during the glue up the bamboo at both tips had shifted a bit (left them a little too thick at the tips for the tight recurve radius) This was a problem because bamboo has a bit of a crown and since it was not really centered at the tips anymore one side of the bamboo will be thicker when you shape the tips to final width. So after first stringing the tips bent over to the side as expected. I did leave them wide so after some shaping from opposing sides and a little from one side of the belly (on the strong side) I got them back in line. For the finishing: The bamboo I used is already caramel coloured and I added some brown paint to the nodes and tips. Sanded the sides after that and added some layers of Danish Oil for the finish. Dulled the shine a bit with super fine steel wool. Respect for doing it with hand tools. Kerfing is a great trick with the non-heat bending woods. Yes a very nice bow and technique.Your cranking them out lately. 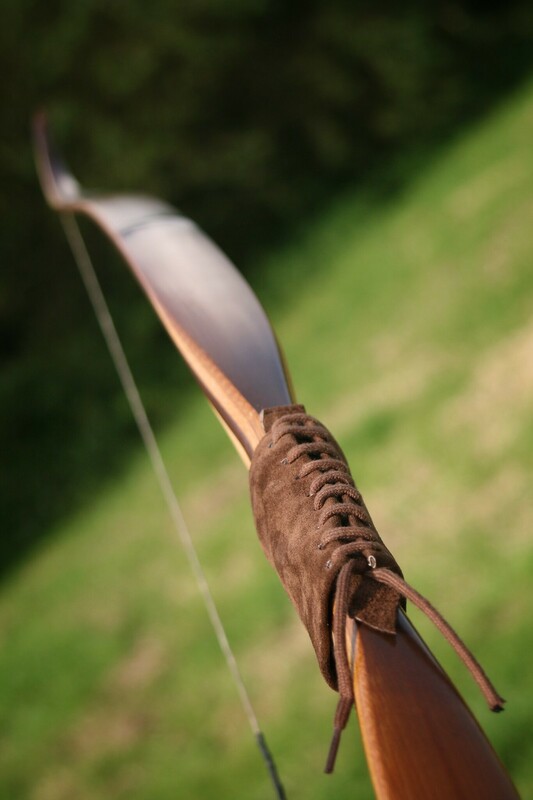 Beautiful bow, I wonder how far it would throw a 500 grain arrow. Looks like a good candidate for flight shooting. 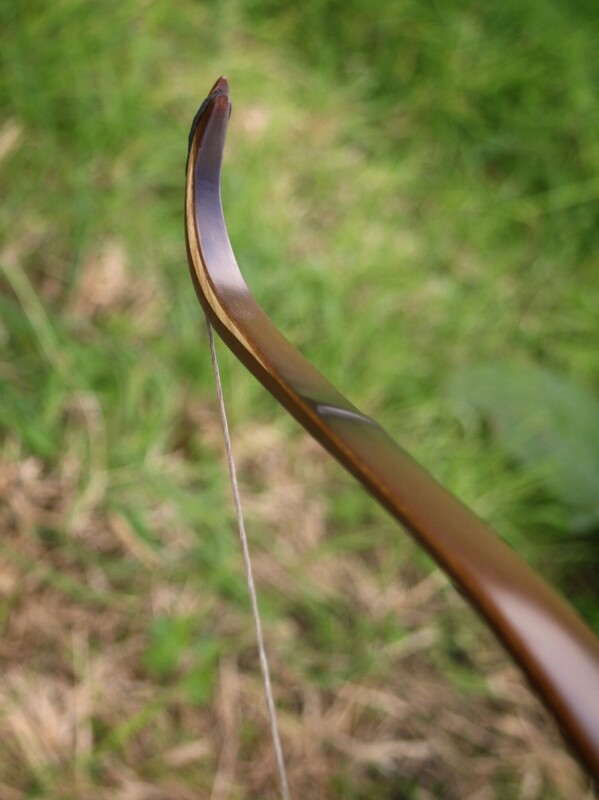 Wow, stunning bow for sure. You're skill set w/ all the different designs is inspiring. Thanks for sharing. I'm no where near as smart as my phone! That's a work of art and function!! Thanks! I will try that because I am curious as well. 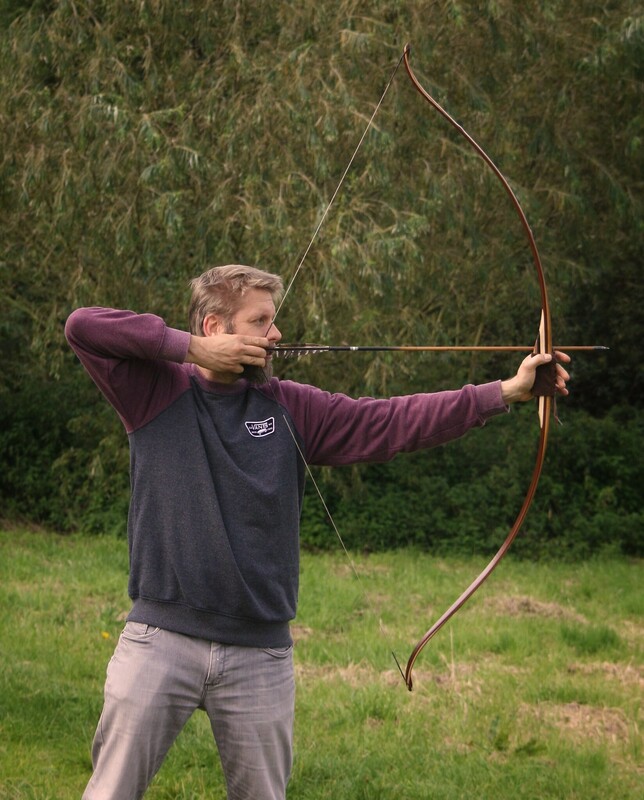 Need to make a slightly more efficient arrow than my standard target arrows with 5" helical fletching though. Update when i got a chance to do so! Love BBI, great combo and nice craftsmnanship! Thanks guys, this was loads of fun to make! If you want to check it for broadhead use a 4" fletch, if you want to check it as a flight shooting bow you need to make up actual flight arrows. 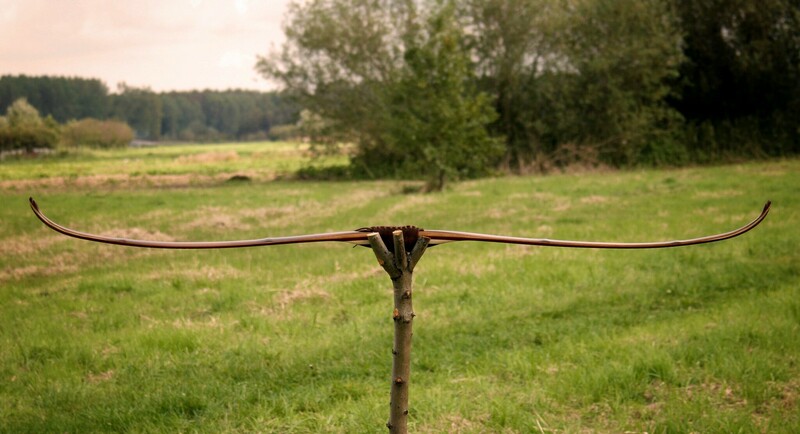 A 280 grain arrow with 1" fletches about 1/4" high will give you a pretty good idea but not your maximum. Flight shooting with light arrows can be hit or miss. 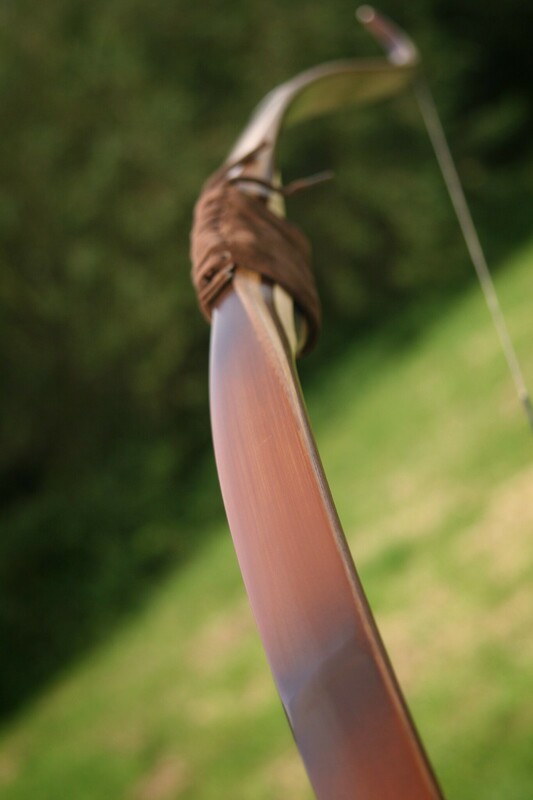 I get better distances with my slower bows most of the time because of better flight. 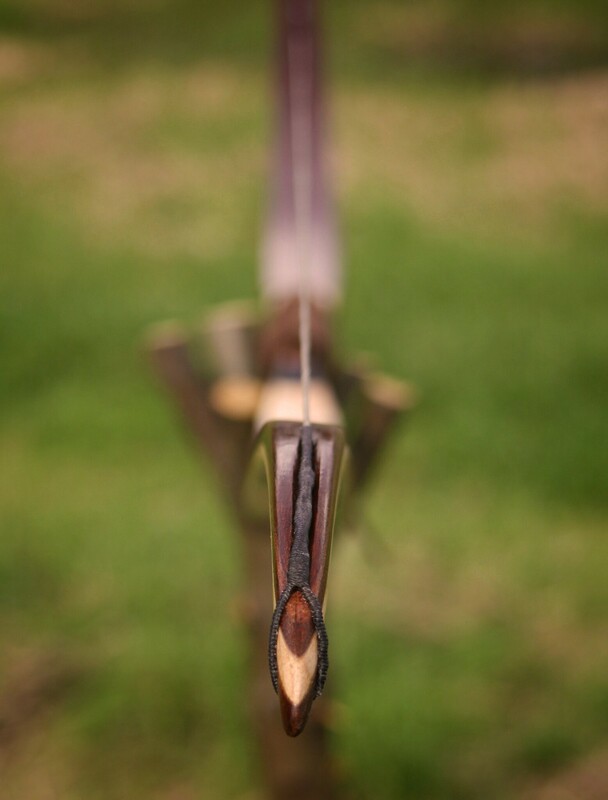 Broadhead shooting is more straight forward and gives you a pretty good idea what the bow is capable of. 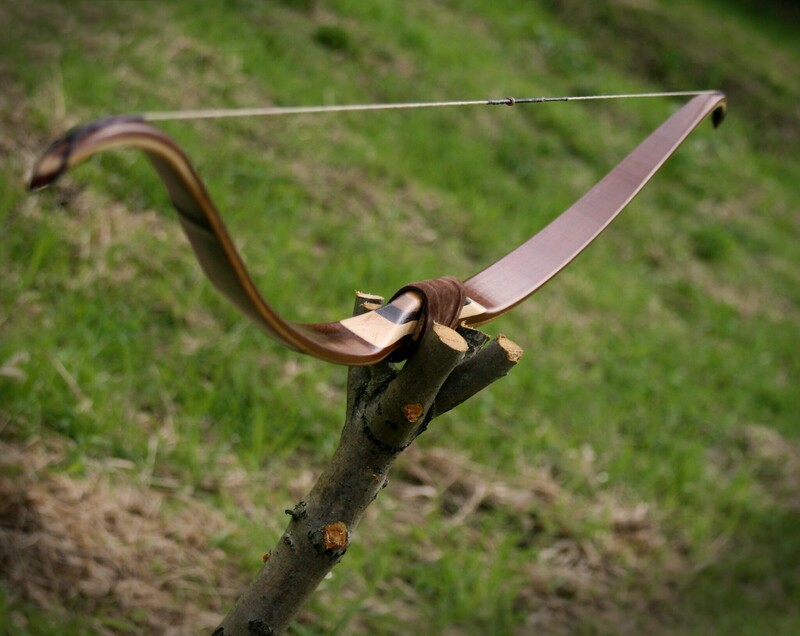 I bet that bow would do pretty well in broadhead. Excellent work! Not very often we get to see ipe with hooks like that. More great finish work too. Page created in 0.847 seconds with 26 queries.